This year I discovered that among the best apartments I could rent for two weeks in Vienna during September was one in Nussdorf, an area in the 19th district on the outer edge of the city. Its borders include the Danube River and vineyards rising up the hills of Nussberg and Leopoldsberg. I was hesitant to rent this apartment because I have never stayed so far away from the city center. However, I like Nussdorf, which I have visited many times during the last couple of decades to access walking trails and try the local heuriger (establishments serving “new wine”). I decided to give it a try. The idea of living in Nussdorf for a couple of weeks in September appealed to me mainly because it would be harvest time in the vineyards, the weather would be great for walks, and many outdoor heuriger would be open. On the down side, I knew that it takes 25 to 30 minutes to get into the center of the city by public transportation, and the travel time would deter me from going there. I decided this time I would trade the cultural attractions of the city for the pleasures of village life, fresh air and local wine establishments. I was not disappointed with my decision. The last half of September was a great time to be in Nussdorf. For most of Vienna’s existence, Nussdorf – like the neighboring villages of Heilingenstadt and Grinzing – was a long carriage ride on dodgy roads from the center of Vienna. The existence of “Nut village”(the English translation of its name) dates back many centuries, and until buses and trams connected it with the Vienna downtown, the village was an isolated spot to which Viennese made day trips or in which they rented rooms to escape from the big city and to enjoy walks in the Vienna Woods. Also, many imbibed at the local wine taverns. The appearance of the old village can be glimpsed in the buildings along Kahlenberger Strasse, a street that starts in the center of the Nussdorf and goes (partly by road, the rest of the distance by walking trail) up to the top Kahlenberg, one of two famous mountain peaks to the north of Nussdorf. Many of the old buildings along the first blocks of Kahlenberger Strasse have their age noted on their facades. For example, as shown in the picture above, one building was the Nussdorf city hall in the 16th century. Perhaps inevitably, because Beethoven moved frequently and loved solitary walks, one house on Kahlenberger Strasse has a sign commemorating his stay there in the summer of 1817. His extended visits in the village and nearby Heiligenstadt likely inspired giving the name Eroicagasse to a street that connects the two villages. My Nussdorf apartment was on Zahnradbahn Strasse, a half block from the D Strassenbahn end station. The track at the end station circles a building that looks like a train station, which it once was. 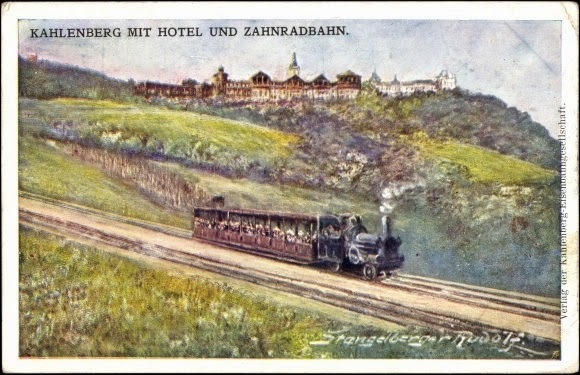 It was the terminal for the cog wheel train (Zahnradbahn) – hence the name of the street -- that from 1874 to 1919 took people to the top of Kahlenberg via Grinzing and Krapfenberg. No doubt this train was crammed on sunny days in spring and fall as people traveled up the mountain to look out over the city and to walk down to Grinzing, Heiligengstadt, or Nussdorf through the Vienna Woods and the vineyards. The former Zahnradbahn train station in Nussdorf now houses a restaurant. Sitting close to it is an open carriage modeled after the one that was hauled up Kahlenberg by the old cog wheel train. That carriage is now pulled by a tractor dressed up like a locomotive to take visitors on a tour of the various heuriger in the area. It is called the Heurigen Express, and it operated on weekends while I was there (see http://www.wienrundfahrten.com/tour-heurigen-express.html). The street car trip to and from downtown Vienna begins and ends at the Nussdorf station. Going into the city, the D heads in the direction of the Hauptbahnhof, the other end station. It goes down Heiligenstädter Strasse (passing the massive Karl Marx Hof) to the Gürtel, then weaves its way toward the ring going by a huge university complex and the Franz Josef Bahnhof. Its first stop on the Ring is Schottentor, located by the University of Vienna. It goes around the Ring with stops in front of the gothic Rathaus (city hall) and the Burgtheater; near the Parliament building; across the street from the entrance to the Heldenplatz; and in front of the Opera. It then turns off the Ring and heads up Prinz Eugen Strasse, with a stop by the Belvedere Palace. The trip on the “D” used to terminate at the South Train Station, which has been demolished. Now, its last stop is the new Hauptbahnhof (Main Train Station) that is being developed as the city’s central transportation hub. The pokey, but comfortable, street cars are not the only way to travel from Nussdorf to other spots in and around Vienna. For example, if traveling to the West Train Station, you can take the D to the Spittalau stop, which has a subway connection (U-6) that take you to the West Train Station via other places along the Gürtel, including the Volksoper. If you want to go to Schwedenplatz (which has a terminal for an airport bus) or to the Landestrasse/Wien Mitte station to catch a train to the city’s airport, you can take the D to the Heilgenstadt stop (in front of the center of Marx Hof) and there change to a U-4 subway. This subway also goes also to Karlsplatz and Schönbrunn. In short, it is easy to get from Nussdorf to most places in Vienna by public transportation, but the travel times are not short. Fortunately, there is enough to do in Nussdorf and vicinity that frequent trips to the center of the city are not needed. Nussdorf is a great location for walks and wine. One of the first things to do in the village is walk around it to get a better feel for its layout and attractions. Start at the beginning of Kahlenberger Strasse (near the intersection of Greinergasse and Zahlradbahn Strasse, just up from Nussdorfer Platz). Walk several blocks on this narrow street to enjoy both the old and new architecture that you see along the way. When you reach the flat, yellow Restaurant Schiefer, turn right off of Kahlenberger Strasse onto Eroicagasse, heading toward the hills to to enjoy more of the village style buildings plus some very expensive suburban houses. At the end of Eroicagasse, you will reach the entrance to the Nussdorfer cemetery and paths up to the vineyards. Turn right onto Nussberggasse and walk to the end of the street, turning right on Hackhofergasse, a part of the the village with newer and less interesting buildings. Go down Hackhofergasse and you will reach Nussdorfer Platz. Turn right and walk a couple of blocks, and you are back to where you started the hike. After that introduction to the city, here are some other things you should do. Nussdorf is located by the spot where the Danube canal splits off from the main river. Although you cannot see the Danube from most places in Nussdorf (it is hidden by the train station and an elevated highway), you can get quickly to the banks of the river. Head to the train station, which is located across the street from Nussdorfer Platz along the busy Heiligenstädter Strasse, and go through the tunnel underneath the station: there is the river and wide paths for walking and bicycling. As you exit the tunnel, you see the start of the Danube canal and shortly downstream is a bridge (guarded by lions) with a river flow regulation system underneath it. The walk toward the city is comparatively under-developed, so the best choice is to walk upstream along the river, away from the city. Fortunately, the pedestrian trail is separated from a paved path for bicycles. The beginning part of the trail lies under an elevated highway built to get people heading north quickly out of the city. After that, the walking path is lined with trees and shrubs, with great views of dachas built on the side of the mountains and the famous river. About a quarter of a mile up the trail from Nussdorf are moorings for passenger ships that sail the Danube. This form of tourism – traveling the Danube by ship – has apparently become quite popular, and every time I walked this path two to four boats were docked there. About 20 minutes up this walking trail from Nussdorf is another village, this one surrounded by woods, hills, and vineyards. Its name is Kahlenbergerdorf, and it is an old village worth exploring. I know something about Kahlenbergerdorf because I was there many times in 1971-72, one of my academic years in Vienna, to walk with my housemate Joerg Wollman up a steep and winding path to the top of Leopoldsberg. The path (Waldbachsteig) is still there and as popular as ever. However, I am not sure I could still make it to the top. If you are up to it, you will enjoy the climb and the views at the top. Kahlenbergerdorf lies on the other side of Heiligenstädter Strasse from the walking trail along the Danube, and it is accessed by a tunnel under the highway. Once you take a look at the village, it is possible to walk back to Nussdorf without returning to the Danube trail. Another trail along the side of the Nussberg mountain links the two villages. Most of the trail is for pedestrians, but a portion of it goes to a sidewalk along the heavily traveled road. Then it ascends again to walking path that ultimately takes you back to the center of Nussdorf. Part of a walking agenda should include visits to Heligenstadt and Grinzing. Heilgenstadt can be reached via Grinzing Strasse or by walking up Kalhlenberger Strasse to Eroicagasse or Armbrustergasse, then walking down one of those streets (in the direction of downtown Vienna) to Probusgasse. At the intersection of Eroicagasse and Probusgasse is the Pfarrplatz, which has an old church and a house where Beethoven lived. Beethoven first came to Heiligenstadt in 1802 to escape the city and seek treatment for his growing deafness. He returned many times to the village during the remainder of his life. http://www.pfarrplatz.at/en/beethovenhouse/beethovenhouse.html. This small square has an old heuriger, Mayer on Pfarrplatz, that claims roots going back to the 17th century. It is a bit of history that merits a visit http://www.pfarrplatz.at/en/heuriger/the-heurige.html. Two other heuriger are open for business along Probusgasse between Eroicagasse and Armburstergasse (discussed later). This area also some attractive restaurants to explore in this area. Walking up Weingrubergasse, if you decide that you do not want to go to Grinzing, the trail heads up the mountain toward Kahlenberg. Going up, there are many smaller trails to take among the vineyards and woods. All offer pleasant hikes with memorable views of the city and the river. Another, and faster, way to get to trails in the vineyards above Nussdorf is to walk up Eroicasgasse in Nussdorf. At the end of that street, turn left on Dennweg and you will see many trails, both paved and unpaved among the vineyards. Alternatively, and more strenuously, you can walk up Kahlenberger Strasse all the way to Eichelhofweg which cuts across the vineyards and offers glorious views. Another good, and easier, way to walk in the Vienna woods and among the vineyards is to take the 38a bus (catch it at the corner of Heiligenstaedter Strasse and Grinzinger Strasse) to the top of either Kahlenberg or Leopoldsberg, then walk down a trail from there. If you are like me, you will get lost, but ultimately will find yourself in one of the three villages at the bottom of the mountains. Typically, if you want to order a heurige, you ask for a viertel (1/4 of a liter), and it is served in a mug-glass with a handle. If you want a regular wine, the basic serving is an achtel (1/8 of a liter), and it is served in a wine glass. The price of a viertal heurige is between 2.5 to 3 euros. Heurige is served in restaurant- and tavern-type settings, most featuring wooden tables and rustic artifacts; these are scattered throughout Nussdorf, Heiligenstadt, and Grinzing villages. During warmer months, heurige is available in more primitive settings, mainly outdoor areas up the mountains amid the vineyards. The locations of many, but not all, heuriger in the vicinity of Nussdorf and Heilgenstadt are shown on a map posted at the beginning of Kahlenberger Strasse. The heuriger has a long history. In 1784, Emperor Joseph II issued an edict allowing people making wine to sell their own wine without needing a restaurant license, which could be expensive or hard to get. However, their right to sell their own wine came with restrictions: the places where they sold their wine could be open only a limited number of days and they were not allowed to serve hot food at their establishments. After this edict, numerous small, sometimes crude, wine-taverns opened in the villages on the edge of the city and others opened in vineyards by trails up to Kahlenberg and Leopoldsberg. As late as the 1960s and early 1970s, many small wine-taverns were selling selling their own wine and serving cold ham, cheese, and salads. I recall in 1971 hiking out with some friends to a heuriger with no electricity in the middle of some vineyards near Kahlenberg. A few of the old-style heuriger still exist, but most now resemble restaurants, serving hot food with their wine. Many are open year round. Nevertheless, whether they are open all the time or only seasonally, most heuriger still hang small boughs of fir or pine trees by their front doors to let people know when they are open and serving new wine. When the small pine or fir branches are hanging, the heuriger is said to be “ausg’steckt.” It is open for business. During this trip, I, along with my friend Natalia, sampled several of the heurigen; we had visited some of these, and others, on previous visits. Here are some observations about them. We found the best tasting heurige was served at Feuerwehr Wagner located on Grinzinger Strasse (#1 on the map). (Feuerwehr means fire brigade; in 1900, the owner of the winery was chief of the Heiligenstadt volunteer fire department.) According to the winery's website, the Wagner family has operated a winery for 350 years. Another heuriger that we greatly enjoyed this visit, and previously, is Buschenschank Ing. Andreas Wagner at Wildgrubergasse 48. It offers outdoor seating surrounded by vineyards, and is a relaxing place to sample heurige on warm, sunny days. Unfortunately, two heuriger that we would have liked to sample were not open when we walked up to see them. They are located halfway up a mountain (a long walk uphill, not served by public transportation!) where Kahlenberger Strasse intersects with Eichelweg. The two open air establishments are Sirbu Hans (for some great pictures of it, go to http://www.sirbu.at/ ) and Mayer am Nussberg (see http://www.mayeramnussberg.at/ ). Both places have tables in open fields surrounded by vineyards, with views of the mountaintops and the city. Both are on our list of places to visit the next time we are in Vienna. One of the most interesting heuriger I visited I found accidentally on the mountain above Nussdorf. Hiking on a trail just above the village, I noticed an unusual “ausg'steckt” sign: it was a wine bottle hanging from a piece of wood that had "ausg'steckt" written on it. It seemed to point up the hill. I could not resist and walked up a steep grade between two rows of grapevines (I admit I sampled the small green grapes along the way and found them sweeter than any other grapes I have ever eaten). After huffing and puffing for ten minutes, I found a small heuriger and two or three dozen people sitting around drinking its wine. The setting and the heurige were memorable. At the end of the two weeks in Nussdorf, I was very glad that I opted for the Nussdorf option when making this September visit to Vienna. While I doubt that I would want to be here in middle of the summer or in winter when walking would be less attractive because of the weather, late summer, early fall, and likely late spring seem to be perfect times to enjoy what the village has to offer. If you are ready for more wine with fresh air and less culture on your next visit to Vienna, find a place to stay in Nussdorf. Thanks. You will enjoy walking in the Vineyards up toward Kahlenburg in early Fall. Good trip! This article is great and incredibly helpful! My partner and I going to Vienna this April and I wanted to do my diligent research about Heurigen ahead of time. During my first trip to Vienna 2 years ago, we too tried to visit Sirbu Hans and Mayer am Nussberg that were up in the mountain but just like what happened to you, they were both closed! Our trip to go to Heuregen was an epic disaster and everything was closed. I think we went on a Wednesday which is a horrible time to go. What day of the week do you think we would have our best luck to visit a few of these spots? I was thinking either a Friday or Saturday, as it looks like some of these places are closed on Sundays. Thank you for your comment. I visited Vienna last April and enjoyed several heuriger. Staying in Vienna, I took Strassenbahn D to the end station in Nussdorf then slurped the tasty new wine at Kierlinger. Its inside rooms were open, but not the outside area. Then we strolled up Beethovengang, which turns into Wildgruber, to Burschenschank owned by Andreas Wagner to sit outside, surrounded by vineyards. I really like the Wagner place and it has great wine, but it can be pretty cool sitting outside in April. (They do provide blankets.) You can also get to the Wagner place by taking the street car to Grinzing (33) and walking up a steep path and down again to get to Wildgruber (the path ends at the large cemetery), then turn left to go up the hill. If the weather is bad, you can always get some decent heuriger and a good meal at at Zum Martin Zepp on the main main drag in Grinzing. The place is open year round (except for a couple weeks in Winter). All of these places were open last April, usually later in the afternoon. Kierlinger and Wagner are my two favorite places because they remind me of the heuriger I visited back in the late 1960s. I think most of the heuriger now have websites so you can check the hours they are open. I hope your trip in April turns out better than your first one. April, October, and December are my favorite times to visit Vienna because in April and October the weather is decent but the hoards have not yet arrived, and the Christmas Markets are fun to visit in December. Also, all of the music venues are open during these months, but not during the summer months.